I've had no luck replacing the shaft seal. The first one inverted and totally deformed while trying to get it to start on the thread protector. The outer lip seemed extremely small and didn't fit unless forced. I used plenty of oil and the smaller o-ring from the kit. The second one I just twisted the heck out of to get it over the thread protector and it seemed to seat fine and didn't invert but it just won't hold a seal. I got the seals locally. Can someone crosscheck the numbers to make sure I have the right seal in the first place. The package says it's for an HD6, HT6. The number is MT2105 santech. It originally had a ceramic seal so I need to order the cage remover tool also. I found a shop here that removed it for me free but I will need one for future use. Thanks for any help. You can get the seals and the tools right here. Drop an e-mail to ackits.com. You obviously have the small seals, which won't work, but the guys here can set you up with the larger ones..Hope this helps.. Interesting, maybe I was wrong about it being ceramic but I thought any of them that had the cage style were ceramic. It had the snap ring, then a metal washer type seal that sealed the o-ring then under that the cage style seal. It was black plastic looking material. The pulley is the standard metric press on. How do I tell how many poles it has? I've had the car for 2 years and it had the compressor then. The previous owner said they recently had it replaced. it is a reman. I replaced the condenser, evaporator (bought from the good people at AMA). I already had the accumulator. I won't make that mistake of buying parts elsewhere again. The seal kit was just a spir of the moment thing. The santech seal kit had a small and a large o-rings, too my eyes they were the same though, I had to choose which matched the existing o-ring that I removed but I did choose the closest match..
As for the seal the Santech should not have been an issue brand wise. But was it the correct seal for an R4? The package didn't list R4, just H6. Do H6's and R4's have the same size shaft? I had to stretch that thing at least an 1/8 inch to get it started on the thread protector. That just doesn't seem right. The thread protector fits snugly on the shaft though. and that's why I'm thinking I just got the wrong kit locally. I didn't mean to infer there was anything wrong with the santech brand, just that I may have gotten the wrong kit. "- the new seal should slide over it with minimal resistance- then snap into place when it is seated inside the o-ring- you can do it all by feel once you do a few.... "
That's what I thought. I felt it slip into place on the o=ring but there was anything but minimal resistance getting it started over the thread protector. H-6, R-4, V-5 all used the same seal.....there was a period of time around 2002 that H-6 went to a larger shaft diameter- but you have the opposite problem- if you got the wrong H-6 seal it would have slipped over too easily. Your R-4 should take the AC delco 15-30948 or GM 2723954. these are what I use-- see if they cross up with your kit..
(R4 - DA6 - HR6) Your link shows these compressors. My santech kit lists HD6 AND HT6. Are they different from the HR6? Did a little cross checking from GMtech's Delco to our main supplier to our main O-ring and gasket supplier. Remember I using their supplied data. What I find interesting in this is doing these crossing GMTech's Delco seems to be a single lip seal. Again according to these crosses which are not always correct or updated. Checking my Seal supplier I believe the same seal kit as the 15-30948 to be a SK-705N. SK-705N crosses to the 21-32504. Tim, your number "21-34734" is what I use on V5's R4's.. as shown on the seal replacement thread..Hope this helps.. I use it also Chick. I just thought I would cross the numbers GMTech posted. I personally still stand behind the two numbers I have listed for the different shaft sizes. Tim, GM tech's numbers are correct, as they are what I used to use also. But a couple years back, we went thru this same problem with small seals, and you found that number for me which is what I use now.. The aftermarket numbers are apparantly wrong (not yours) but the number I gave, 21-34734 is what crosses with the GM and Delco number..Won't forget that again... Hope this helps..
Where did you find the cross for those numbers? Right but I manually looked up the seal itself. As stated the two numbers we ended up with are correct for our double lip seals. 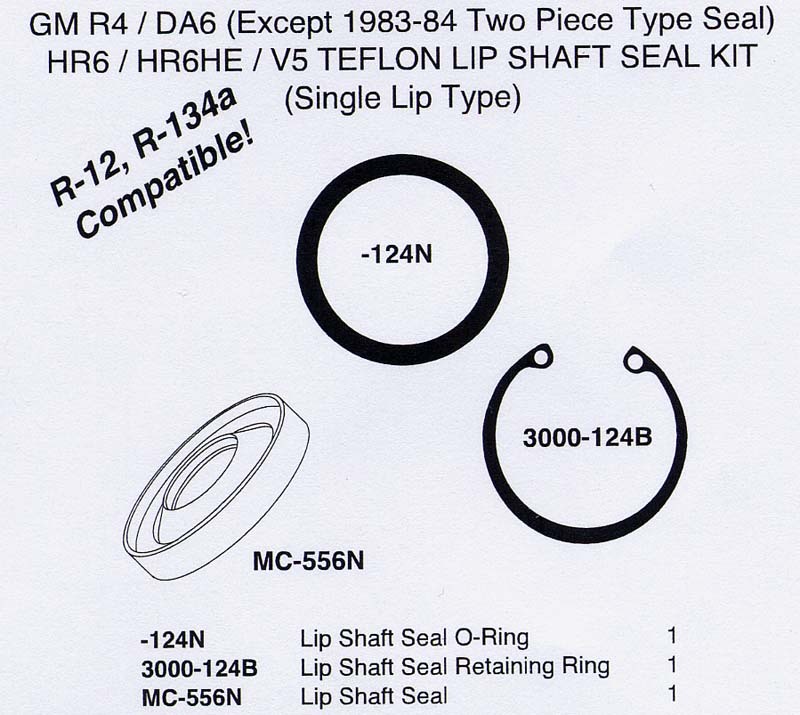 My question in this post is the 15-30948 really a double lip seal? I searched all over the net today and every parts house just says lip seal, including the Delco site. Yes it is Tim, I still have one of those too. And you can see the two lips, I can send you a pic of the "Delco package" with both numbers on it , and try a closeup of the double lip if you'd like.. In fact I got them from a local GM dealer at the time, and they came in the Delco package with both GM's number and the Delco number on it..
Good, my only concern here was if someone not knowing the difference. Bought a Delco seal thinking it was a DLS and getting a SLS. But if Delco updated the product within the item number all is good! To dman : The pic below shows the "cage, ceramic seal, and the "replacement double lipped seal". If you only pulled out what looks like the one on the far right, it;'s a regular lip seal and no cage is inside. If you pulled out a ceramic seal, no rubber in the middle, then you have a cage below it. But I think you just have them confused. You can order item number 21-34734 from Ackits.com and you will have the right double lipped seal for your R4 compressor..Hope this helps.. Thank you. I will place my order first thing in the morning. I definitely had the 2 piece seal. May I suggest amending the instructions for replacing the shaft seal to include mentioning the original seal, like mine, may be a two piece seal, and you will need the "cage" removal tool in addition to the "lipped" seal removal/install tool. Just a thought and I may be wrong if it already mentions it but thanks again for all the advice and excellent step-by-steps. ........ and great pricing ....and great customer service .... and fast shipping. A rare combination these days. I watched a YouTube video of a guy changing a seal . He lubed the seal and the seal / shaft protector real well . Then forced the seal over the seal protector , backwards , to stretch the seal . He said it would make it easier to install , when he went to install it ( the correct direction ) , for real .